This is a beautifully renovated 4 bedroom, 2 bathroom home. It boasts breathtaking views over Merimbula, the lake and right along the beach to Pambula Beach by day and night... you'll want to return again and again! 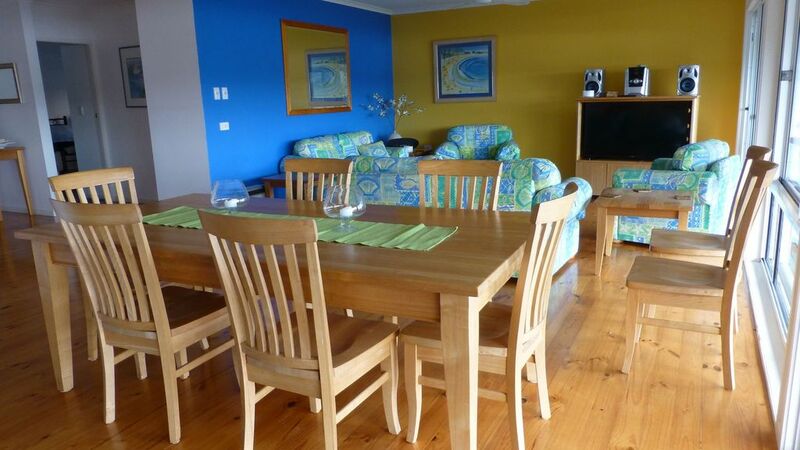 The Hillton has lovely furnishings and all modern conveniences comfortably sleeping 8 people. With an enclosed backyard giving ample space for children to play. This exceptional holiday property is just 3 minutes walk to Bar Beach, and is perfect for families. - enclosed backyard where you can keep a eye on the kids from the deck upstairs. A most relaxing and enjoyable holiday. House has everything and most comfortable. Sensational views! This is a lovely house in a great location. We were there with 2 children and the house worked perfectly for our needs - very family friendly and comfortable. The house has stunning views of both the lake and ocean beach from the large living / dining area upstairs. This area opens onto a balcony and shaded outdoor dining area with Weber BBQ- a great spot for meals and sunset drinks that overlooks the spacious grassy back yard. The gorgeous bar beach with its great kiosk cafe (best coffee we found in Merimbula!) are only a short walk away. Although not super-modern in style, the house is very well maintained and stocked. The owners were also very approachable with questions and were in touch throughout our stay to ensure everything was in order. Linen can be organised through the property's cleaners who will also make up the beds. We really enjoyed our holiday and will hope to return - would definitely recommend the Hillton to others. What a fabulous place to spend a holiday with the family. Simply gorgeous and the perfect home to relax and feel spoilt while on holidays. Spent a week enjoying this great house for a family holiday - ages ranged from 82 to 22! Fabulous views and really comfortable beds. The owners were great to deal with and a very seamless process. The Hillton has great views and a good layout for a large family. The position is fantastic and it was very clean, with a well equipped kitchen. The television downstairs didn't work on many channels which was a bit of a pain for our mainly wet and cool week. But a great house that we would certainly recommend. Juliet, the TV downstairs works perfectly - it was an issue with the whole Merimbula area at that time caused by the extreme weather event.